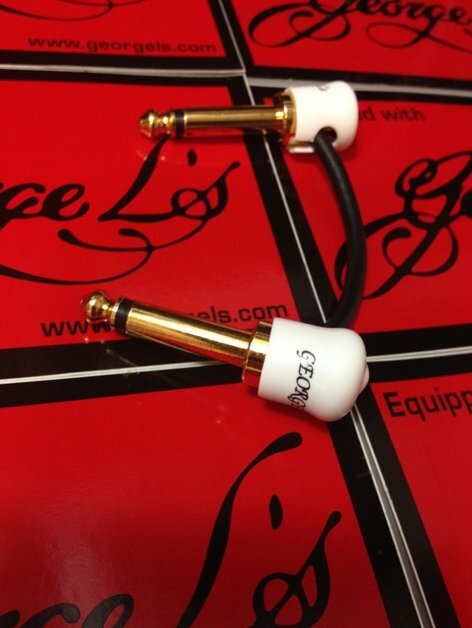 Pre-made with black George L's .155 cable and gold plated plugs to fit exactly in a JTM, JMP or similar vintage Marshall. This custom-made George L's patch cable is approximatly 3"" (three inches) in length and is designed to fit in a JTM, JMP or similar Marshall Amplifier. ""Jumping Inputs"" in a plexi Marshall is often done to achieve a warm, fat tone. Many of the worlds greatest guitarists did this (Jimi Hendrix, Jimmy Page, Eric Johnson), so why not join the party!? The ends are gold-plated and right-angled. The cable is .155 gauge and black in color. The end-caps on each plug are white.